Big White ski resort. Snow to die for!!! Big White ski resort is one of those resorts where dreams begin. Let’s look first at what the mountain offers. Dry, very dry powder. They call it Hero Snow because it makes you look so good. It’s dry because the damp air out on the coast looses it’s moisture because of the altitude and the result is nice, fluffy dry powder. On average 25 feet of it nestles down onto the slopes and promontories better known as Big White. The mountain’s 2,760 acres of ski area make it the second largest ski mountain in British Columbia. Throw in mild temperatures, and plenty of sunshine make it a delightful resort for your memorable vacation visit. If you want to trim down for that next hike to the mountains or ski outing visit Fat loss 4 Idiots. Because it is nestled between the sky and the earth at an altitude of 5300 feet, one often skis above the clouds at Big White Ski Resort, on natural snow cover and on an amazing variety of terrain. It goes from the large blue 'boulevards' groomed to perfection, to one of the five bowls where the champagne powder is at its best and where even the less seasoned skiers can venture. The Black Forest sector is a wonderland that allows novices and intermediates to glide easily through the trees. Every evening after the fun of the day becomes a memory to take home, the grooming crew set to work, erasing the tracks of the day’s fun and replacing the runs with a new corduroy for tomorrows skiing pleasure. Big white was awarded “Best grooming in the West” by Ski Canada Magazine. Big White Ski Resort on Big White Mountain, one of the highest peaks in the southern Monashees, truly lives up to its name, with well over 100 marked runs fanning out from the summit of Big White. Last year six new runs were added to the amazing inventory of exciting skiing at Gem Lake and the Cliff Chair. The Cliff Chair accesses Big White's famous "Cliff Area" leading to many untouched powder stashes. With the expansion addition of six intermediate runs adds just under 200 acres of skiable terrain. The runs at Gem Lake will increase the variety of trails in this fantastic and exciting area of the mountain. At Big White Ski Resort, you don’t have to stop skiing when evening comes. Instead you can ski under the bright lights of the largest night skiing area in Western Canada. You enjoyed the mountain during the day; now you will have a whole new experience at night. The Plaza Lift will be open from 3:30 pm to 8:00 pm and the Bullet Chair will be open from 5:00 pm to 8:00 pm. The night skiing feature also includes TELUS Park, Big White’s world class terrain park. TELUS Park is open for night skiing Thursday, Friday & Saturday from 5:00 pm until 8:00 pm. Big White Telus terrain park features an Olympic size super-pipe, snow-cross course and rail park. TELUS Park is a winter playground like no other. Snowboarders will love the snowmaking and lights for night riding, boarder cross, and the double chair to get you up there faster. Why not remove all of the hassles of arranging hotels, car rentals, bus tours, ground transportation, motor-home rentals, etc. Irma and Joe will be happy to arrange everything for your vacation trip. We offer a free quotation without obligation. Simply click on the globe, fill in the form and leave the rest to us. 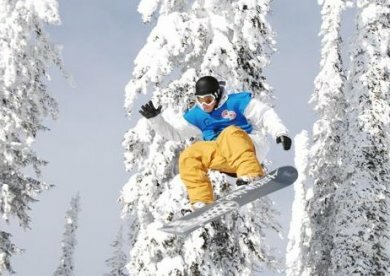 Big White Ski Resort has supported the growth of snowboarding, being the forerunner in park development . Big White is a natural snowboarders paradise, the glades, gullies, tree lines and bowls create a natural skate park-like setting. Riders of every level of experience can find terrain suited to their interests and needs. From the original super park featured in 1997 Snowboarder Magazine, to the recent development of TELUS Park, Big White is now in a category of it’s own when it comes skiing and snowboarding. TELUS Park, with its own lift, night lights and the progressive park program that we integrate in all our feature construction makes, it a place any skier or rider can come to ride. You may have come to Big White Ski Resort simply for the skiing and snowboarding, but when witnessing a sunset such as those enjoyed from atop Big White, you will feel you have made an unspoken appointment with nature to have your consciousness altered. The hoodoo-like bestiary that form each winter near the top of the snow-domed mountain are a sight never to be forgotten and will keep you coming back for more. You can mush a dog sled, traverse snow-covered hills by snowmobile, tour the backcountry on snowshoes, ski the miles of perfectly groomed cross-country ski trails or treat yourself to a massage at one of the two full service spas. As one of the largest on-mountain villages in Canada, Big White is the place to do it all. Weather it be a day skiing, a soak in a hot tub, a skate on an outdoor rink, or a sleigh ride through the wilderness and winter’s landscape covered in deep champagne snow. A unique feature of Big White Ski Resort is it’s connection with Silver Star Ski Resort. Take the Inter-mountain Day Trip Shuttle to give you the opportunity to ski or snowboard two world-class resorts on one affordable lift ticket. The shuttle runs every Thursday from Big White to Silver Star Mountain Resort and from Silver Star to Big White. Deer and Black Bears will stand in awe, and so will you as you meet these wonderful creatures eyeball to eyeball. 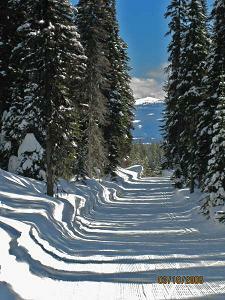 Big White is located 56 km (35 miles) south east of Kelowna, a city of 150,000 and is easily accessible. From the Airport you may take the Big White Ski Resort shuttle that will take you right to your door. Here are a few mountain and resort details. Resort Services….Restaurants, Cafés, Bars and Lounges, Ski School, Equipment Rentals & Repairs, Medical Clinic, Grocery, Liquor Store & magnificent shopping.